*NEW TIMES Prefunk the Bryant Way! *Sorry for the back and forth on the timing. 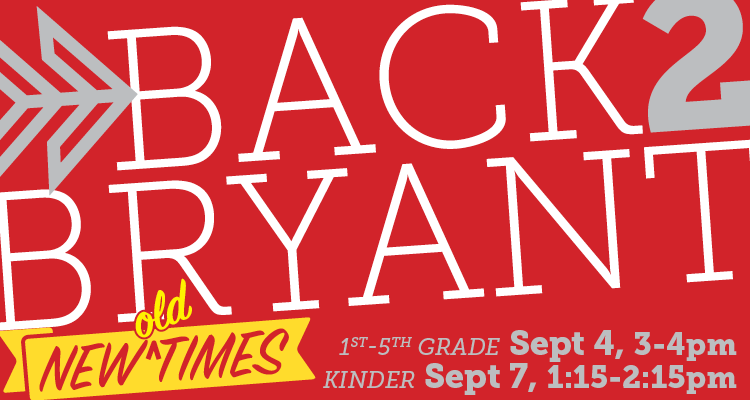 With the teachers’ union and district reaching a tentative agreement, and the SEA membership having its vote next Saturday, Tuesday afternoon is now open for the 1st-5th grade Back to Bryant event at its original time, with Kindergarten classes open on Friday. New this year… Ease back into the school year with a visit the day before classes start! Check out your new classroom, establish a nickname with your new teacher, and find the best spots in your new homeroom at this is a casual re-entry to the year. No need to bring anything other than yourself. When you’ve had enough classroom time, come join everyone out on the school yard for some lemonade with lavender or rosemary from the garden, and photo booth fun until you’re ready to go home and get prepared for the big day.